Los Angeles State Historic Park sits on the eastern edge of Chinatown and just south of Dodger Stadium. When community members fought a proposal to build industrial sheds on the site, the state acquired the dusty 32-acre site in 2001. They held a design competition that was won by a team led by landscape architect George Hargreaves. But the park service didn't have the funds to build his ambitious scheme and starting in 2006, an interim park played host to music festivals, film screenings and public art installations. Then the 2007 economic downturn coupled with community demands for softer landscaping and less complex hardscape, prompted them to simplify the design. "The ultimate design was the result of a distillation of over 65 public meetings, which is really unprecedented," park superintendent Sean Woods told DnA. "If you think about the way government agencies design parks, usually the park is designed by a crew of so-called architects or experts… We realized that we needed to have a very extensive and inclusive planning process." The area was closed to the public in 2014, and after years of delays related to budget concerns, soil contamination and the drought, the park's renovation is finally complete. It cost $20 million, using voter-approved Prop. 40 bond funds. 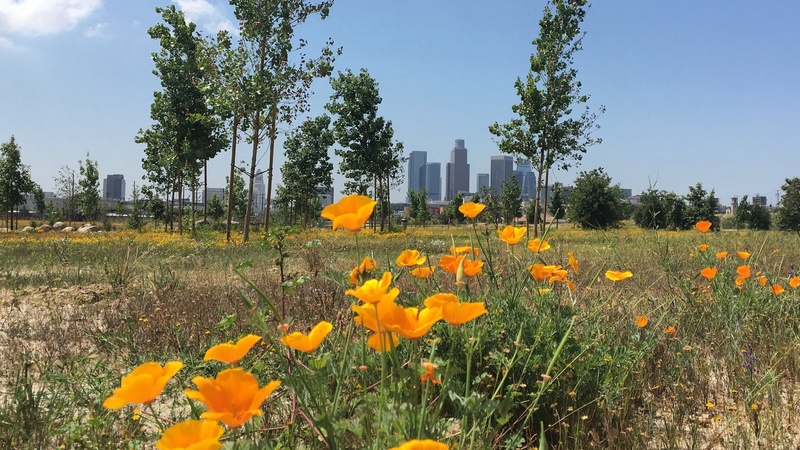 The park now hosts grassy open spaces, picnic tables, educational areas, wildlife conservation habitats -- including a large area of bioswale at the site of the original riverbed -- and 1,500 newly-planted trees. In view of the drought, park planners were not allowed to use potable water for irrigation so they trucked in recycled water. As of this week, a pipe connects directly to a supply of recycled water. A grand opening celebration is planned for Saturday, April 22 from 10 am to 6 pm, with musical performances, family-friendly activities and food trucks. The park has a lot of history. It's located near the original site of the Tongva village of Yang-Na. The water needs of the young Pueblo de Los Angeles were met by the Zanja Madre, the original aqueduct that ran across the area. A passenger station built in 1876 served the Southern Pacific Railroad. A new sculpture by artist Rosten Woo commemorates the "Chinese Massacre" of 1871, when a mob of 500 white people killed 19 Chinese men and boys. And just north of the park is where more than a thousand families were forced out of Chavez Ravine in the 1950s to make way for Dodger Stadium. More improvements are in the works for the park, including an elevated pedestrian walkway to connect the park directly to the nearby Gold Line Metro station. An ambitious plan called "Bending the River Back into the City," led by artist Lauren Bon of Metabolic Studio, would construct a 70-foot-tall water wheel to draw water from the L.A. River to irrigate the park and other green spaces.